Preheat oven to 300 degrees. Bring cream to a simmer over high heat in a small saucepan. Cut the vanilla bean in half lengthwise and scrape the seeds into the cream, then add the vanilla bean pieces. Remove from heat and let stand for 30 minutes. Bring a saucepan of water to a boil. Combine egg yolks and sugar in a bowl and beat until pale yellow and thick. Place a fine mesh sieve over the bowl and strain the cream mixture into the egg mixture. Whisk until smooth. Place a paper towel (this keeps the ramekins from slipping) on the bottom of a baking pan large enough to hold the two ramekins. Set the ramekins on the paper towel (to prevent slipping) then fill each ramekin with even amounts of the custard mixture. Pour the boiling water into the pan to come halfway up the side of the ramekin, being careful not to splash any water into the mixture. Bake approximately 25 minutes or until set but still slightly loose in the center. Remove from oven and allow to cool in the pan for 15 minutes then transfer to a wire rack to cool to room temperature. Place in the refrigerator for 2 hours to cool completely. 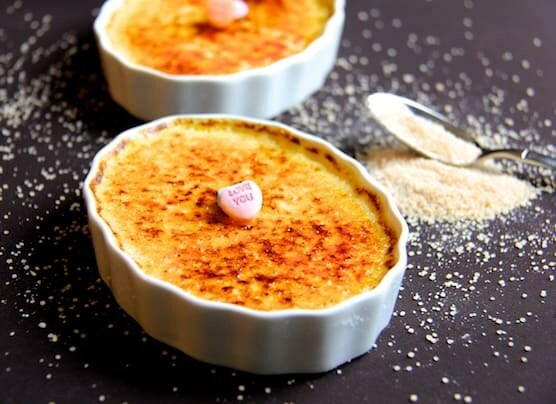 Once the custards have cooled, sprinkle the top evenly with sugar. Using a blow torch or kitchen torch, carefully brown the top to caramelize the sugar to form a hard candy coating. Allow to cool before serving.